Thankful Thursday: Thank Goodness For The Kindness of Strangers --Part One. A couple of years ago, my mother told me a story of one time when she was a teenager she made a trip to Morehead City with her mother and while there, they took a ride in the country. Now I know my mother and we have a similar sense of humor. I know when she was riding in that car she was probably thinking to herself, "Um, How much more country are we talking about here?" My mother was visiting from New York so Morehead City was looking country enough for her. Ha. Anyway, she recalled they were driving out in the woods for quite a ways and finally came to this place where two sisters lived. To her they looked "Indian" or something. They were fair skinned with freckles and with long reddish brown hair. She remembered they were petite. They were referred to as some of her "grandmother's people." She's carried this memory with her all these years and wasn't sure who they were. Today, I believe I was able to confirm who they were from the help of several kind people. Earlier this year, I wrote about my trip to New Bern and Morehead City to pay my respect to my Aunt Rosa who had passed away and also to connect with other family members. Along the way I was able to take time out to visit Mt Olive AME Zion Church in Riverdale, NC. Next to the church and running behind it as well there is this wonderful old African American cemetery where a number of my ancestors are buried. I visited their graves and walked through the whole area to take things in. When I went to leave, I noticed that there was a church event going on and some people had pulled into the parking area. One lady who was unloading what I believe was a tray of food or something from her car, caught my eye as she went inside. I started to walk back to my car and she came back out of the building. I smiled and I almost didn't stop to say anything. We were still a distance from each other. Can you imagine that? Then I said to myself, "Ask! It doesn't hurt to ask." So I introduced myself and explained why I was visiting the cemetery that day. I asked her if she knew anything about the church's history. She knew only a little. I then asked if she would be able to take my name and contact information and that if she knew of anyone who knew more about the church's history if she could pass my information on to them. I still have to kick myself sometimes when I hesitate to ask for help. Oh well, I will keep working on that. Back to the connection to the two sisters. I returned home to upstate NY and life went back to normal. I didn't know if anything would come from leaving my information with that lady. I was at peace with the idea that at least I tried. Then I get a phone call out of the blue, from a gentleman who found my blog online, who grew up in the Riverdale community. 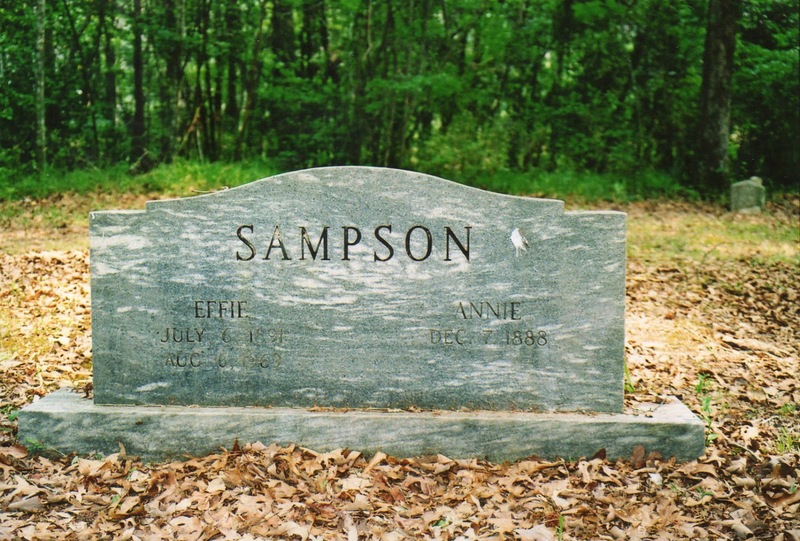 He attended service at Mt Olive in his youth and has family buried there in the church cemetery. I don't know this for certain but I think he received my telephone number from the lady I spoke with back in January. Next I get a message on Facebook from a lovely woman who used to pastor at Mt. Olive. I had completely forgotton I had written to her some time ago. She forwarded my contact information on to a friend of hers who she thinks could help me. She provides me with information that I will write about in another blog post but incredibly...there's more! She puts me in contact with someone who knew two sisters. They had freckles and were petite in stature and had long reddish brown hair. 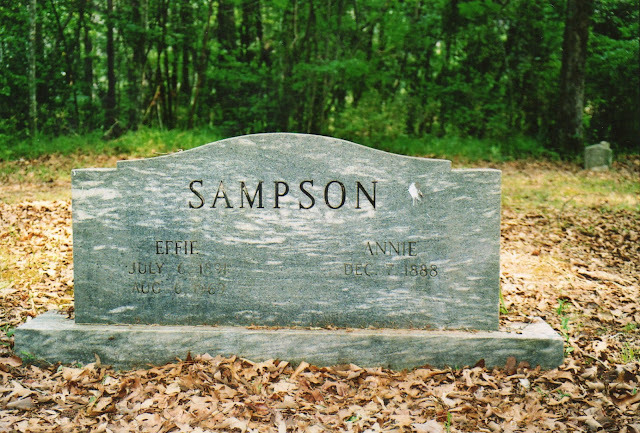 Effie and Annie Sampson graves. My 1st cousins 3x removed. Graves are located at Mt Olive AME Zion Church in Riverdale, NC. How great to get them identified. Yes indeed. I am just so happy to have been able to provide some closure for my mom regarding this memory she had. She was young when she met them and so her memory had this dream like quality. I am glad that I was able to provide some real details and verify what she remembered. I so love this journey!